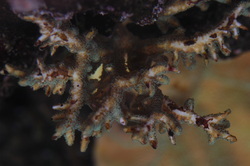 There are plenty of uncharacterised diseases which occur in aquarium, most of which don't fit into the specific remit of the named diseases described on this site. Here we show some of these and one of our long term goals is to characterise these diseases as and when we find them. 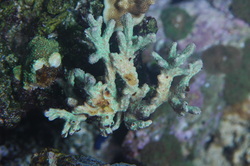 If you’d like to help with this, then try and take detailed macro photos of any unexplained tissue loss; record the rate of the tissue loss (over hours/days/weeks etc) and where possible as many other photos of healthy individuals of the same species in your tanks and the diseased coral. With this information, we will help with identification of your disease. The whitish yellow patches on this Hydnophora rigida is a yet undescribed disease sign. 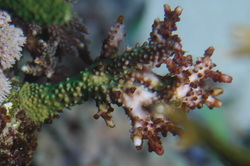 This tissue loss on a Acropora sp. is very patchy with no clear structure or advancing line as seen in the White Syndromes. 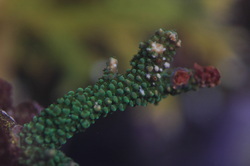 You can see Green Boring Algae colonising the bare skeleton at the left hand side of the lesion but not in advance. Whether this algae is a cause or consequence of this disease remains to be addressed.